I’ve created a list for Advanced Chinese: Intention, Strategy, and Communication! It can be found here! Skritter has just published Anything Goes (Revised Edition). This textbook is a monster, with over 3800 items jammed into 30 chapters. The list can be found here. I hope this helps anyone who’s studying the textbook! 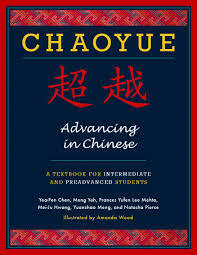 Skritter has just published the Chaoyue: Advancing in Chinese vocab list. The textbook contains 18 chapters and 895 vocab items. The direct link can be found here. Hope users studying this list enjoy! Dear Skritters, I need some advise. Living in Malaysia I started learning Mandarin (simplified) about 7 months ago and now know about 700 characters via Skritter. I also had some local face to face tuition. Unfortunately I am not able to practice my Mandarin a lot since most Chinese Malaysians speak a dialect such as Hokkien, Hakka, FuChow etc which are significantly different than Mandarin. Anyway, I miss a study strategy for Skritter, so far I just picked a study list and go through it till complete and pick my next one. I am asking for some advise on what study lists to use to advance properly and I am looking for study lists which have more than single or double words and allow me to practice small sentences. Looking forward to any great advise. Thanks Ximeng! Going to study this. I made some a few months ago that may be of interest. And also two different simplified radical systems. The first is for the Oxford Chinese Dictionary (1st ed, 2010), the second is for Xinhua Zidian (11th ed, 2011). The list descriptions give the differences between these two systems and with Kangxi. Just search for my username and you will get them. If you are using the Spoonfed Chinese Anki deck, you may be interested in this list I made from it. When I found the Spoonfed deck online, it made a huge difference. I use it each day because I don’t yet know enough to speak intelligibly in Mandarin with my friends, and I need to practice listening and speaking. It has about 10,000 sentences with audio, arranged somehow so that easy sentences are first, and each sentence introduces at most one new word. On some cards I listen to the audio and try to interpret it, and others I attempt to read it aloud before listening to the answer. I suspect the sentences roughly follow HSK, because I understand them all so far. The list contains all 6554 unique words in the order they appear in the sentences. I made it by exporting the deck from Anki into a spreadsheet, then eventually getting the sentence column as a text file. I then wrote a Python program that uses the Stanford word segmenter to break the sentences into words, and output each one on its first occurrence. I then pasted all the words, 100 at a time, into the Skritter list sections. Typically Skritter would be unable to find 1 to 4 words, but I do not know enough Chinese to figure out if it was ignoring real words, or artifacts of the segmenter, so I left them out. I have to admit that I am ahead of myself. I am not yet studying the word list I created, because I really want to get through the list from HelloChinese (an android app) and HSK 1/2 first. I used an Anki extension to extract it from Memrise, then exported it to a spreadsheet. The sentences are broken into words using the Stanford Segmenter. I pasted the resulting sections into the Skritter legacy list editor. This week Ma Laoshi and Fi Laoshi took to YouTube to talk about Skritter’s Avengers list for Chinese, but that isn’t the only list we’re working on! Ma Laoshi also created this handy list for “Going to a Coffee Shop” learn about popular drinks, ways to spice up your order, and more. No dialogues, no grammar patterns. Just super useful words to help you feel a bit more comfortable with coffee shop words and phrases in Chinese. The deck is a series of 8000+ sentences ordered by word frequency and chosen so that each one adds only one or two new words. This list is all of the vocabulary from that Anki deck in order of first appearance in the deck. This is broken into words using CEDICT, so there is some redundancy (e.g. all of the individual days of the week, multi-word expressions that have CEDICT entries, etc.). NOTE that this is NOT a good list of “Chinese words by frequency”. There are many such lists on Skritter. This is the result of someone else (the Spoonfed deck maker) using aggregate word frequency against a corpus of sentences to order the sentences. The result is that there are common words that don’t appear until very late (for example, I happen to remember that the second to last word out of nearly 8000 words was 己, and since it picks out phrases from CEDICT it found the first occurrence of 是不是 many thousand words in). You will also see all of the months, days of the week, etc, peppered throughout. I extracted a list from a cooking youtube channel: 小高姐的 Magic Ingredients . Many of her recent videos have subtitles, so I extracted them all and sorted them by frequency. This list only goes down to the words appearing at least 4 times. Most of the words are simply very common words (the first entry is 的 just like in any frequency list) so you probably know a high percentage of the words. Haven’t made a list for it yet, and not sure if I ever will, but currently, it’s in my Pleco. Reading a free PDFs textbook found here http://www.hwjyw.com/ which is quite helpful and I haven’t found the list in Skritter yet.